"WHAT ALL GOOD DOGS SHOULD KNOW" by Volhard and Bartlett is a good training book for your new pup. 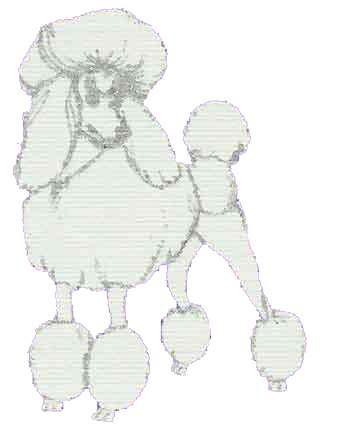 "THE EVERYTHING POODLE BOOK" by Janine Adams tells you whatever you need to know about poodles. Martin Goldstein DVM’s book "THE NATURE OF ANIMAL HEALING" is an excellent book on health and well-being that should be in every dog library. 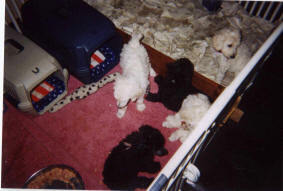 CRATE: 24" x 36" crate, or 400 Vari-Kennel, is the usual size for most female standard poodles when they’re full grown. Males require the next size about 26x42. For the young puppy, you’ll have to block off the back section by putting in a milk crate or box so the pup has just enough room to go in, turn around, and lay down. If you leave it too big, the pup will convert the rear into a "bathroom" area! You can use old towels for bedding initially or imitation shearling crate mats. Sometimes pups will chew up nice bedding while they’re teething. Use stainless steel or crockery water and food bowls. http://www.jbpet.com.I use stainless flat back 2 Qt buckets with double ended brass snaps to hang inside the crate for water, or on a fence outside for the dogs. Cherrybrook, 800-524-0820, www.cherrybrook.com or J-B Pet Supply, www.jbpet.com 800-526-0388 are two local New Jersey catalogs with good prices. Good source for inexpensive shearling bedding or the plush donut beds is the White Dog Bone Company, 800-682-9671 or www.whitedogbone.com. Also Pet Edge, www.petedge.com. Get macho sticks and other natural treats from www.sitstay.com and www.petedge.com. http://www.sitstay.com. Use SIMPLE SOLUTION or NATURE’S MIRACLE for puppy accidents. GROOMING: any tearless puppy shampoo if an interim bath is needed. Be sure all mats are out before wetting pup. (Use your hairdryer on warm (never hot) setting to blow pup dry. Start from the rear and work forward, using lower speed around head and ears. Get a soft slicker brush such as #1 All Systems, Doggieman, or Warner’s for the pup. It must have a soft rubber backing. Eventually, for longer hair, a #1 All Systems Pin Brush is good. A greyhound type chrome comb with coarse and finer teeth is essential to comb through the coat after you have brushed it, to be sure there are no mats. A poodle comb of this type is available with longer teeth for longer coats. Dogs should be professionally groomed every 4 to 6 weeks if possible and must be kept brushed out between groomings or you will be charged by the hour for mat removal. TOYS: soft plush toys are good, balls of all sizes, tug toys, an old tennis ball in the toe of an old cotton sock is good for throwing, tugging and play. Use a buckle collar and 4' or 6' lead for walking. A flexi-lead is good for secluded areas but must be kept short in an area with car traffic as pup can easily dart into the street if you are not careful. A number of trainers now prefer a buckle collar for training as well, with positive reinforcement via clickers and treats. Choke collars can do trachea damage and can be very dangerous if left on an unsupervised.dog. If the end of the collar gets caught on something, the dog can strangle. You will want to find a puppy kindergarten class or basic obedience class as soon as possible. Best exercise for a growing pup is just running around in the back yard, with you throwing toys for it to fetch. You can take it for short walks to your neighbor’s property but a walk around a long block is too tiring for a growing pup and too hard on its bones and joints. Also not a good idea to expose too much until the puppy shots are completed. DO NOT take the puppy jogging until it is FULL GROWN, well over a year of age!!! Dogs sleep about 80% of their lives and pups require even more. Be sure pup gets down time. Call with questions, even if you think they’re silly, 908-537-9146 or email msbanta@earthlink.net. Azalea's puppies becoming well socialized. Ringo in a puppy pose!